If you have researched where to have wedding pictures taken you have probably seen all of the ‘popular’ places. 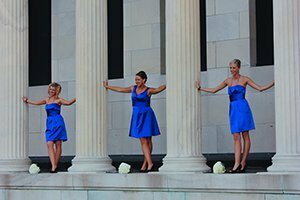 In Buffalo, NY the art gallery is a favorite place for wedding pictures. The marble columns and stairs make for a great backdrop. Hoyt Lake across the street is also a wonderful spot BUT like i said earlier, they are VERY popular. Seems like everyone wants their pictures taken there and we have had to wait for an opening on the stairs to get some pictures. You will want to take this into consideration when choosing a location. When asked for suggestions on where to take pictures I like to ask my clients to describe what they like along with the style of photography they prefer. What do they like to do, where do they like to go. Define themselves. What is it about them that makes them special to each other. From there we can look for places that are ‘theirs’. You will want your pictures taken in a place that is special to the two of you. A place you are comfortable in. Where you can be yourself and have fun.